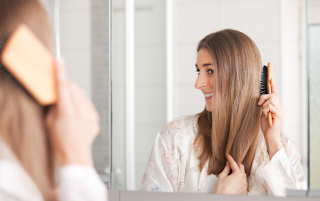 Add health and shine to your hair by following these beauty tips for the shower. Showers can be damaging to your hair. A long hot shower can strip your tresses of their shine, bounce and body, leaving them dull, lank and lifeless. Equally, the products that you use in the shower, and how you use them, can make or break a hairstyle. Follow these hair care beauty tips and start looking forward to the admiring glances that your lustrous locks will attract. Hot water can cause great stress and damage to your hair, creating dry, brittle strands and split ends. Tempting though it is to stand under the running water and turn the temperature up bit by bit for relaxation, it is your hair that will suffer most. Keep your shower’s water at a mild temperature that is comfortable, but not overly hot. Finish your shower with a blast of cold water that will add shine to your hair and improve your circulation. Rubbing your scalp vigorously with a cheap shampoo in the shower is guaranteed to give you damaged, lifeless hair. First apply a small amount of shampoo to your hair, and massage gently until your head is covered with foam. Rinse with warm water, then rinse again for a minute with slightly hotter water. This will open up the cuticle of the hair to help the conditioner absorb. Wash your hair daily to prevent a build-up of oils and styling products. Many people don’t bother to condition their hair in the shower, making the biggest hair care blunder of all. Conditioners are vital to keep your hair manageable when styling, to combat frizz and to protect it from pulling during blow drying and combing. For correct conditioning, squeeze the moisture out of the hair after rinsing off shampoo. Apply a small blob of conditioner on the hair and spread it out gently with your fingers, then put on a shower cap and wait for five minutes. Rinse the hair with warm water, then with cold. Squeeze out the moisture, wrap hair in a warm towel for a few minutes, then let your hair air-dry or blow-dry it. Every person’s hair is different, so it is vital to choose the right products to take into the shower with you. Avoid cheap shampoos and conditioners, and opt for natural brands instead. Aveda’s Shampure is loved by models and celebrities, and is gentle enough for daily use. Daniel Field’s Organic and Mineral range is suitable for vegans and full of natural ingredients. Most important is to find a product that matches your hair type, so don’t opt for a full-body conditioner if you have wild frizzy hair!